WordPress is no longer just for bloggers — it’s been transformed into the most popular CMS (content management system) on the Internet. 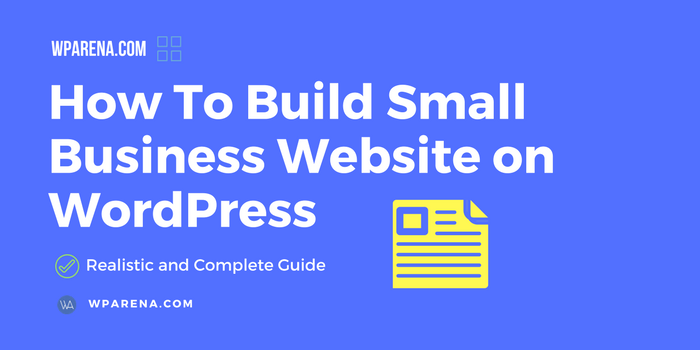 Using professional designers and developers can be costly, but with WordPress, you can easily build a website for your business that is functional, optimized for search engines, and attractive — all without learning traditional coding. Small businesses, in particular, are drawn to the convenience and simplicity of WordPress. They don’t have the bottomless pocketbooks of huge corporations and yet still require a high-quality platform on which to display their goods or services. In addition, if you end up needing or wanting a developer down the line to improve the quality of your website, it will not be difficult to find one familiar with the WordPress program due to its widespread popularity. Before you begin development, you will need to outline goals and objectives for your website. What do you want your visitors to do when they visit your site? Will you have an online store for products, a contact/inquiry form, or a blog? It is best to outline the general layout of your site and then to have a list of pages you want to include. You can always add, subtract, or make adjustments as you develop — but having a layout will help you make any difficult design decisions because you’ll have an idea of what you want your end product to look like. Before you start designing, you’re going to need to come up with a domain name. It can be helpful to use a catchy phrase or the name of your business. You can register for a unique domain name with this helpful tool. Choosing a domain name that has not been taken can be tricky, but also forces you to be extra creative which can be a huge benefit to your brand. Next, you’re going to need to purchase web hosting. The important thing to remember here is to purchase hosting that supports the WordPress platform — preferably with the 1-click installation. Bluehost is a great example of an appropriate hosting service for WordPress, although there are others in the marketplace. Use 1-click WordPress installation through your web host in order to launch your site. Select your domain name and you will be directed immediately to your new website’s Dashboard, which is similar to the driver’s seat of a car. You’re now officially live and you can visit your website by typing your domain name into your browser. The first step you need to take to start designing your site is to select a Theme. This is a helpful article that outlines things to look for when selecting a WordPress theme. It gives you a detailed overview of the pros and cons of free versus premium themes so that you can decide which one is right for you. The most important consideration when choosing a theme is to pick one that matches your type of business. In the theme marketplace, you will find many options specifically created for particular kinds of businesses and may want to consider using one of these for simplicity moving forward. For example, you don’t want to choose a theme geared towards bloggers if you own a law firm — it will automatically set your blog as the dynamic landing page, which is probably not the first page you would want users to see (if you even plan on having a blog for your law firm!). In your dashboard on the left side of your browser, you can select “Appearance” and then under this “Theme” and it will pull up your selected theme. Click “Install Themes” to install a new theme. Remember, the theme you pick doesn’t need to be forever — you’re welcome to change your theme in the future if you decide the one you’re using doesn’t quite meet your needs, or perhaps you want to start with a free theme and later upgrade to premium. There are some basic steps you need to take to make sure your website is effectively connected and functioning properly. Go to “Setting” in the menu on the left and click on “General”. The first thing you need to do is enter your “Site Title” and “Tag Line“. There are tons of additional plugins you can browse on the marketplace that will provide you with specific functions you may want to include on your site. Do some research on plugins similar businesses are using in order to get ideas about which ones might be appropriate for you. You’ve finally reached that point where you’re going to have to dig in and start getting your hands dirty — it’s time to start adding content! So you don’t feel overwhelmed, start with adding simple pages, such as directions to your business or contact information. Your landing page is where you should invest the most time and energy — this page will give users a first impression of your business. It should include enticing and informative content that will encourage them to continue browsing your site. This might be the point where you bring in a professional writer for help — having a solid landing page is worth its weight in gold.